As I noted earlier this week, there's just been an explosion of iPod accessories. Docks were everywhere (many with video output), as were perhaps hundreds of different speaker systems, maybe over a thousand iPod cases, and even some keyboard designed especially for iPod users. Others have taken the concept a step further. I saw two (possibly three) different keyboards with iPod dock connectors so you can plug in a 3G or later iPod. Like the Matias keyboards, all of these keyboards are white to match current Macs, and one of these keyboards uses modules so you can remove the iPod dock and put in a flash card reader. On the subject of keyboards, DS International showed a very nice Mini Mac Keyboard. As you'd expect, it's white and has all the usual Mac keys. What you might not expect is the compact size - it's only two keys wider than the main part of a regular keyboard. This keyboard uses Cherry keyswitches, one of the better brands on the market. Another nice keyboard is part of the new wireless combo from Logitech, a product that was used in a lot more places than just the Logitech booth. The Logitech Cordless Desktop S 530 Laser for Mac includes a very nice keyboard and an excellent mouse. Personally, I've been using Logitech's better wireless keyboard/mouse combos for years and love 'em. The most unusual keyboard I saw was the fabric keyboard from Eleksen. It's intended for PDAs and cell phones, and it's less than 1mm thin. You can roll it up, spill coffee on it, and even include the equivalent of a scrollwheel in the design. Models support Bluetooth and USB, and Eleksen offer a wide range of custom options. You'll also be seeing this technology in clothing, like the Kenpo Jacket with built-in iPod controls. I saw some nice, low-cost graphic tablets, but the most intriguing input device I found was the IRISpen, which is available in both express and executive versions. IRISpen is part of a whole series of OCR devices from IRIS that also includes business card readers and OCR software (it's the standard software that comes with HP scanners). 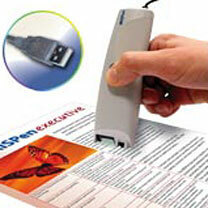 The IRISpen is a handheld USB device that scans a line or so of text at a time, up to 22 point type. The executive version ads bar codes and printed handwriting. The IRISpen can scan text right into your favorite word processor, database program, etc. You need a Mac with a G3 or later CPU, a USB port, and Mac OS 9.0 or later. If you're looking for a small device that can quickly scan in, recognize, and output a few lines or paragraphs of text, this looks like a winner. I also saw their IRIScard business card scanner demonstrated, and it can automagically distinguish URLs, email addresses, phone numbers, and the like. It can also export the information to Address Book, Outlook, and Palm Desktop. IRIS makes black & white and color versions. The Readiris Pro software applies the same kind of thinking to text recognition on the printed page. The software can automatically identify different blocks of text on the page and even recreate the page - graphics and all - in Word, RTF, and other formats. I can't say how accurate it is (most OCR is good, but not good enough that you shouldn't proofread what they've read). I also saw what appears to be one fantastic piece of software for OS X users, WorkStrip 3.2 from Softchaos. WorkStrip is much more than a superior Dock replacement, it also lets you create custom workspaces with different workstrips and even different desktop images. WorkStrip also lets you quickly preview any type of file - text, images, sound, video - without launching an application. That's just the tip of the iceberg. From what I saw, I'm pretty sure WorkStrip can make any Mac user more productive. This is what the Dock should have been, and it works nicely in conjunction with the Dock. I hope to review is in the near future. Speaking of productive, what would you say to a 1.2 GHz upgrade for a titanium PowerBook G4? If you have a 550 MHz or 667 MHz TiBook with VGA output, that's how fast you can go. The US$500 price includes installation by Sonnet Technologies. I've seen a lot of laptop cases and sleeves, but now I've seen a great idea. The Hardcover Case looks like a thick portfolio, but when you open it up you find you 1" thin PowerBook inside. It's available in 12", 15", and 17" sizes. This won't replace a case for travel, since you'll want you AC adapter, some cables, maybe a mouse and some other accessories. Instead, it's designed to replace sleeves, which have two drawbacks. First, they provide very limited impact protection. Second, you have to put them somewhere. With the Hardcover Case, you have padded hard covers to protect your 'Book from impact and scratches, and since it's attached to your 'Book with four small round Velcro pads, it stays on your notebook while you work. You can even fold the top underneath and use it as a laptop stand. There's also room for a CD, business cards, paper, and a pen. Highly recommended at US$40. If my TiBook weren't already so beat up, I'd probably have one today. Another intriguing notebook accessory is myPower ALL from Tekkeon. This compact external battery (3.3" x 6.8" x 0.9") weighs just 11.8 oz. and outputs up to 4A. 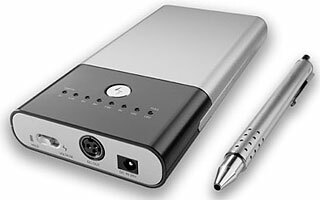 The myPower ALL can be set from 3V to 14V and uses a range of power adapters for all sorts of different products - Apple's 'Books, iPods, portable DVD players, Windows laptops, and more. The lithium polymer battery keeps myPower All lightweight, and Tekkeon estimates 3 hours of use with a notebook computer. An external battery isn't an ideal solution for notebook users, but if you need extra power or have an older laptop where replacement batteries are unavaible or prohibitively expensive, this US$120 battery might be a perfect solution. It's certainly lighter than carrying a second 'Book battery. We may also see a higher capacity battery in the future. I can't see this as a particularly practical iPod battery - although it promises about 100 hours - but there were plenty of other iPod batteries (replacment internal batteries and external packs) at the show. One iPod nano accessory I really liked was the ABT iJet for nano, which has a tiny built-in FM transmitter, a clear protective cover, and small remote control. It also has a pass-through dock connector. That's right - scratch protection and an FM transmitter for use in the car in one device. ABT also makes iJet with Dock Connector and an iJet that fits on the top of 3G and 4G iPods and the iPod mini. All of the iJets support wireless remote control up to 150' away. The Dock version has a pass-through Dock connector, and the regular iJet has a pass-through for the iPod's headphone jack or video cable. I hope to review the iJet after I get home, and I've already had some fun experimenting with it. I finally got my hands on the iLanyard from iDiddy, a device that lets you hang your iPod around your neck and manages the earbud wires. Clever. If you're tired of tangled wires, worth a look. It's designed to work with iDiddy's cases for the shuffle, mini, G3, G4, and nano. 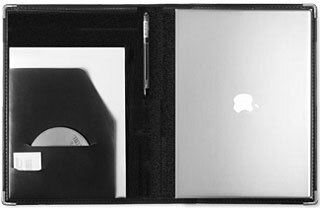 Another interesting product from iDiddy is the Commuter Case, which has room for an iPod, the earbuds, business cards, credit cards, and more. I'm not sure how practical this would be in daily use, but it's a clever idea. Finally, there are a couple of neat products from Macally. Their FM Cup holds any iPod with a dock connector, charges the iPod, and includes an FM transmitter. Macally's Icetune speaker system is very cool. When it's not in use, the two cylendrical speakers stack, and the dock goes on top of the stack. To listen to your music, separate the two speakers, put your iPod in the dock, and enjoy.